Alex de Waal’s article ‘The end of famine?’ awarded the Elsevier Atlas Sweden’s proposed “Democracy Criterion” for arms exports – Taking the lead in export controls, or new words for old policies? 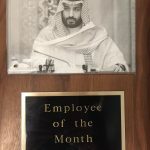 It was only a matter of time before the Saudi ruling family earned the honor of the WPF “employee[s] of the month.” The Saudis regularly inspire us in our work: their support of Wahhabism worldwide, premier role as recipients of bribes in the global arms trade, and their general conduct of the war in Yemen, for instance, help keep us focused on the need for world peace. Even their triumphs, like the newly minted right of women to drive give us pause (one can celebrate for the women who will benefit, but it also serves to pinpoint the country’s position on the map of women’s rights) to consider them on a regular basis for the honor of being our EOM. Further to the point, is the central role of the state-family at the center of the country, enshrined in the Saudi ‘constitution’ – a document worth engaging in the not so time-consuming commitment of reading it in its entirety. This brings us to the EOM awardee for December: Crown Prince Mohamed bin Salman. Appointed Crown Prince in June 2017, his primary positive trait is being under 80 years old—a rarity for Saudi rulers. The ways in which he focused his energy of late drew our attention. In November, the young Crown Prince took decisive action against hundreds of the country’s elites, accusing them of corruption and locking them up in the Ritz-Carlton. Many have subsequently been released after agreeing to pay back their ill-gotten millions to the State (i.e. the Royal Family). Not so much an anti-corruption drive, as a shake-down. Their five-star detention center is not our foremost concern, but rather the shocking double-standard in who suffers for an affront to the crown: royals who embezzle millions get incarcerated in the Ritz, while civilians in Yemen (as discussed below) get starved to death. It is not hard to believe that most of the forced residents of the Ritz are criminals, but so too are their jailors. Prince Mohamed also kidnapped the Prime Minister of Lebanon, Saad Hariri, who dramatically announced from Riyadh that he was resigning, as the Saudis tried (and failed) to install his elder brother in his place. “We are not herds of sheep or a plot of land whose ownership can be moved from one person to another,” responded Lebanon’s Interior Minister Nohad Machnouk, a member of Hariri’s party. French President Emmanuel Macron journeyed to the Saudi capital to remind the Crown Prince that one simply doesn’t kidnap other country’s leaders, and would he please let the Lebanese head of government continue in his role? Following his departure from Saudi grip, Hariri later announced on December 5th that he wasn’t resigning after all. The shortage means areas hardest hit by war, malnutrition and cholera lack functioning hospital generators, cooking fuel and water pumps. It also makes it harder to move food and medical aid around the country. At least one in four people in the nation of 28 million is starving, according to the United Nations, as a three-year civil war, stoked by regional foes Saudi Arabia and Iran, rages on. Ignorance is no excuse. If the world had a criminal court capable of taking on powerful actors, Mohamed bin Salman would find his place in the docket charged with crimes against humanity for his role in perpetrating this famine crime.